DMS meteorological and aerosol experts develop a cutting-edge technology for investigating the chemistry of airborne particles, which is critical for the understanding of climate science. This work specifically addresses the need for ice, water, and other particle measurements in the atmosphere, especially in the Arctic and Antarctic regions. Compact instruments that can be deployed in unmanned aerial vehicles(UAV) measure cloud particles of sizes ranging from 10-1000 microns in a control/target volume. We have devised a non-intrusive technique to visualize one droplet or a group of droplets and determine their sizes and 3-D shapes in a laboratory or test site environment. The droplets may be static or moving at low speeds to high supersonic speeds relative to the target. 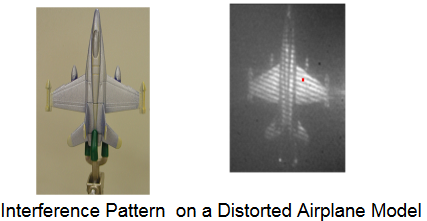 The overall objective this work was to develop separately a digital dynamic holographic interferometry technique to measure dynamic surface deformations of typical targets. The capability can measure dents from micron size up to several millimeters using single wave or composite wave length (heterodyning). 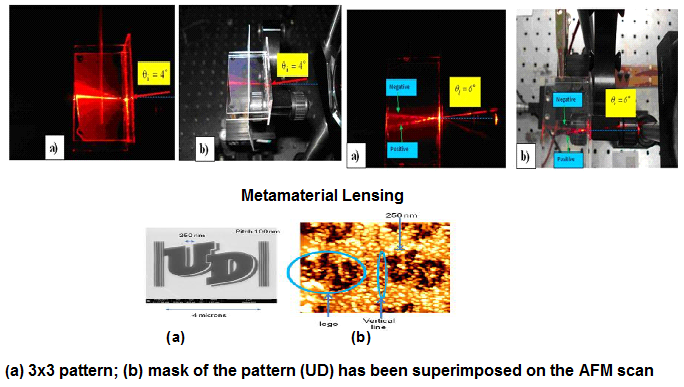 The objective of the investigation was to design a negative index metamaterials (NIM) lens for sub-wavelength imaging in the visible spectrum. A pair of plasmonic and polaritonic nanoparticles was used to create a double negative index metamaterial (NIM, both negative effective dielectric permittivity and negative effective magnetic permeability) to obtain a refractive index with a negative real part of the refractive index. The concept presented here uses one important innovation in developing an optics-based system using dynamic holography with photorefractive materials. Holographic optical recording in three dimensions is employed. Simple bench-top demonstrations are conducted to measure attitudes, distortions and vibrations, and are applied to both diffuse and reflective objects.